‘It’s the age of Quad Cores’, said every smartphone user last year and as soon as the year changed, Samsung sprung up with their Exynos 5 Octa processors at CES 2013. 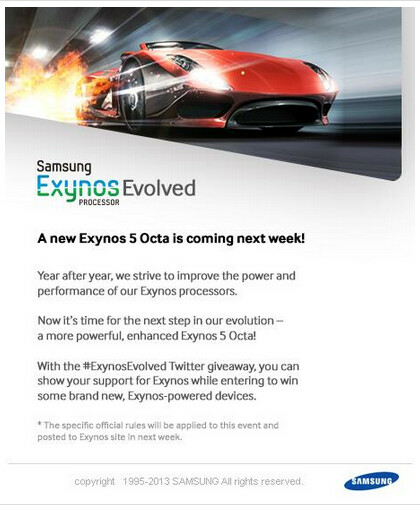 With only 6 months passed, Samsung is at it again with an annoncement of Exynos 5 Octa Evolved Next week. Samsung hinted the release of the next Octa Core processor through a tweet with this picture attached. With the details in the image, it is pretty clear that new Exynos 5 Octa will also be a processor with 4-core functionality at a time. 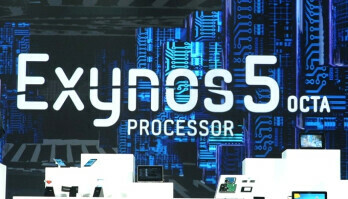 The originial Exynos 5 Octa had two sets of Quad Cores, A-15 for heavy usage and A-7 for light usage. Both sets did NOT work simultaneously. The new Octa will also run on the same logic except improved clock speed and performance.